MoveOn.org is a radical liberal political activist group with 3.3 million members in the United States. MoveOn.org says they bring "real Americans back into the political process". The liberal demagogue George Soros and a partner donated five million dollars in 2004 in an unsuccessful attempt to defeat the reelection of President George W. Bush. MoveOn.org participates in the Americans Against Escalation in Iraq coalition. The Washington Post cited MoveOn.org along with the liberal anti-Semitic group, A.N.S.W.E.R., as one of the early opponents of removing the fascist regime of Saddam Hussein. 1 Have you no sense of decency? The U.S. Senate, in response to the public outcry against the liberal activist organization's conduct, voted 72-25 to condemn MoveOn.org. 23 Democratic Senators added the voices of their constituents to the general sense of indignation MoveOn.org, subsidized by the New York Times, brought to civic discourse on a critical discussion regarding national security. Of the Democratic presidential candidates, Sens. Joe Biden and Barack Obama were absent, though Obama had voted 20 minutes earlier on a Democratic effort to circumvent the amendment. Sens. Hillary Clinton and Chris Dodd voted against condemning MoveOn.org's guilt by association smear. The New York Times which carried the ad, gave a discount to the radical group. The American Conservative Union has filed a complaint with the Federal Election Commission against both the New York Times and MoveOn.org to investigate if the discount constituted a corporate soft money contribution to a federal political committee. A fictitious creation of MoveOn.org meant to represent the merger of corporations and the Republican party. At the final debate between Conway and Rand Paul, a woman protester from MoveOn wearing a blonde wig, attempted to reach Paul and give him a Republicorp award before the audience wrestled her to the ground. Articles about MoveOn.org from "More News"
↑ Mobilizing Online Against War, By Cynthia L. Webb, Washington Post, March 11, 2003. 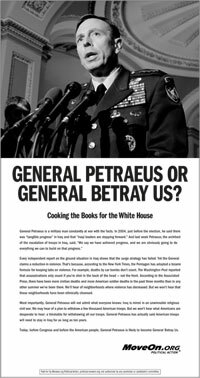 ↑ MoveOn.org Calls Petraeus a Traitor, Do Democrats in Congress agree?, by Pete Hegseth, Weekly Standard, 09/09/2007. ↑ Senate Votes to Condemn MoveOn for Ad Attacking General Petraeus, FOX News, September 20, 2007. This page was last modified on 9 April 2019, at 12:54. This page has been accessed 28,216 times.